The burbot is an engima, a mystery, a fish unlike any other. It is the only freshwater member of the great codfish family. The cod is the most important food fish that has ever existed on earth. Like the saltwater cod it descended from, the burbot is a northern fish - a fish of the stormy, ice-wracked waters that have wrecked ships and killed men since the first Norsemen braved the northern waters to catch them. The burbot prefers deep, cold water, darkness, and secret hiding places. The life of the burbot is timed to strange cycles: the wind, the winter, the eternal darkness, and the midnight sun. The burbot is a devourer. It is a true ambush predator, prone to attack and swallow anything it encounters whether living or dead. Other names: The burbot is also known as eelpout, lawyer, lush, loche, methy, ling, lingcod, and mud shark. Its Ojibwe name is Mizay. "Mizayikaa" means "there are many burbot." Chanting this phrase repeatedly is a great way to pass the time while waiting for the burbot to appear. It really rolls off the tongue: "Mizayikaa ... mizayikaa ... mizayikaa ... mizayikaa ..." I think it actually attracts burbot to your hook ... but your results may vary. Often described as "eel-like", "snake-like", and "slimy", the burbot is actually fairly typical in appearance for members of the codfish family. This amazing fish is one of the favorite winter targets of roughfishers worldwide. The ventral fins are often elongated into filaments. They have two dorsal fins, the first short and triangular, the second very long - extending almost all the ways to the small, rounded tail fin. At times, the burbot's eyes appear reflective or glassy-white, like zombie eyes. At other times, their eyes look black and alive. The burbot has a cavernous, extensible mouth with thousands of small, sharp teeth, like those of a catfish or bass. A single, whisker-like barbel grows from the lower jaw. The burbot uses this barbel to probe the mud for the scent of its next victim. Burbot can be distinguished from all other freshwater fishes by the single barbel they wear on their chin. The taste-sensitive barbel helps them detect food when hunting in darkness along the bottom of the lakes and streams where they live. Burbot occur in a surprising variety of shapes and colors. Adult spawning females can be grossly fat, while many juveniles and burbot encountered in the summertime may be extremely thin. While most burbot tend to be some shade of brown, they can also be leopard-spotted, yellowish, pale buff, almost black, or some combination of the above. When caught in muddy areas, their bellies are often covered in a layer of slimy muck when brought to hand. Burbot come in all shapes, sizes, and colors. Here we see examples of burbot that are yellow, leopard-spotted, dark and fat, and ghostly pale. Burbot can live wherever they can find cold (55°F or less), oxygenated water and plenty of food. They don't care much whether they live in a river or lake, so long as the water is clean and cold and their belly stays full. Burbot also love darkness and cover, and often can be found lurking under rocks and logs, or beneath undercut banks, slithering out only at night to gorge themselves on whatever prey they can find. Rock crevices, shipwrecks, and logs are favorite places to hide, but where no cover can be found, the burbot does not despair. In Lake Laberge, in the Yukon Territory, hundreds of burbot hide in a series crater-like depressions at night. It is theorized that many generations of burbot have excavated these wide, circular holes by swimming repeatedly in a circle. In the southern part of their range (including all of the lower 48 US states), burbot most often live in deep, cold lakes. Few rivers south of the arctic region are clean and cold enough for burbot year-round. 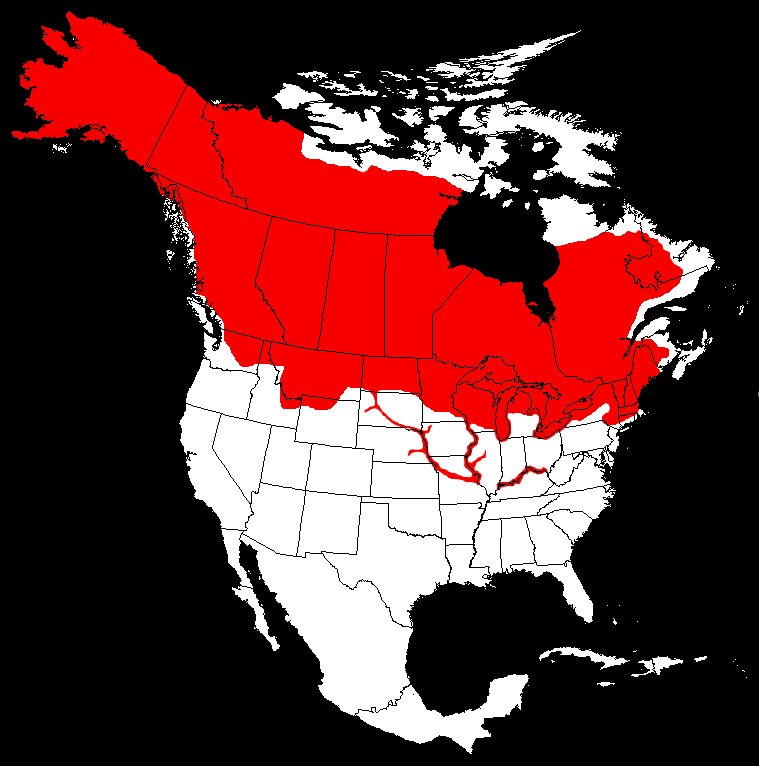 In the far northern reaches of Canada, Alaska, and Siberia, burbot can be found in most rivers and lakes. European and Russian Burbot also exist, although this wonderful fish has sadly become extinct in many parts of Europe. Burbot, like all codfishes, spawn in the wintertime. Some populations migrate out of their home lake and into connected tributary streams to spawn, while others spawn on rocky reefs and shoals right within their home lake. A single lake may harbor both migratory and non-migratory populations of burbot. Male burbot make a "drumming" noise by rubbing special sound-producing muscles against their swim bladder. Their mating call sounds almost exactly like a grouse drumming. "It was February and the mercury was down far below zero. We had come in the middle of the night to watch the spawning of the eelpout, those brownish, eel-like deep water fish that thrive in the coldest lakes of the north ... As we neared the upper reaches of the Burntside River, we could hear the rapids murmuring through the dark. It was at this spot we would see them for they need shallow water, gravel and sand for their breeding. Not until we were within ten feet of the bank did we shine our lights, and then saw such a sight as few have ever seen—a struggling, squirming mass of fish, the long brownish snaky bodies twisted around each other, the entire contorted mass turning over and over beating the water into foam ... I had seen that night a primitive picture that I could never forget, a picture of what might have taken place in some cold primeval pool millions of years ago. There was life in the raw obeying the great urge to reproduce, the one implacable law of creation." The timing of this spawning event can be difficult to predict. In general, it occurs between the beginning of January and the end of March, with southern populations spawning earlier than those farther north. There is much speculation with regard to exactly what natural phenomena stimulate the burbot to migrate and spawn, including full moons, dark moons, equinoxes, water temperature regimes, and day length. Establishing solid run-timing is essential for mastering your local burbot population. All that can be said with certainty is that spawning happens in the wintertime over a period of 1-2 weeks. The smaller males begin arriving in the river several weeks before the spawn. In the days just before and after the spawn, the large females appear. During this time, rivers with good burbot runs can positively fill up with fish and spectacular winter angling can be had. Burbot eggs are very small. A large female can produce several million eggs during a single spawn. Young burbot live in shallow water, often curled up under flat stones in riffles or on the tops of rocky reefs and shoals in lakes. Burbot naturally feed on ... anything. Although their most common food is other fishes (including smaller burbot), they will also eat crustaceans, amphibians, and even birds and squirrels. In essence, anything in the water is fair game for a hungry burbot. Burbot will take both live bait and artificial lures. Bottom-fishing tactics that work for catfish will also work on burbot. Large minnows or smelt, both alive or dead, are good options for bait. Burbot will also take nightcrawlers. Lures such as jigging rapalas, heavy jigging spoons, and swedish pimples work wonders on burbot when fishing through the ice as well. To find them, look for deep water with a rocky bottom. Burbot are predominantly nocturnal, so concentrate your burbot fishing efforts at night. This might not hold true during their spawning run, however, so keep an open mind and start your fishing foray in the daytime. Top is my favorite open water rig - the half hitch rig. Dacron is the ideal leader line but braid works well too. A single half hitch helps a ton but with a whole baitfish I usually use 3-4 half hitches working from head to tail. That really holds the smelt when the rips are trying to rob you blind. The bottom one is my favorite ice set line rig. Glow spoon with a smelt chunk on circle hook dropper. Jig it occasionally, otherwise let it sit and flip around in the mid water column currents. Hasn't been a high percentage rig but it has taken a fair number of burbot and has saved the day for me a least a couple times. Burbot can be strong fighters once they reach a certain size. They are not above retreating into a crevice or under a log once hooked, so be sure to tighten your drag when fishing for burbot in heavy cover. In late May I head to the Deh Cho region to fish the mighty Liard River. Longtime Roughfishers have seen most of following pics. Some of the most exciting fishing I've ever had. My personal best fish was 17 lbs and 41 inches landed last year. I've caught several others over 10 pounds the last few years. Fishing the Liard for burbot is bait fishing in this chocolate brown water. My usual setup is a three-way swivel rig still fished from shore with a cisco threaded through the lips on a large Gamakatsu hook and as large a weight as I can comfortably cast from shore. Burbot are extremely adept at finding the bait. I've chummed the water by tossing cut pieces of cisco into the river from shore and found ever single piece in the burbot I've caught after cleaning them later. As far as subarctic fish go, they are the best eating around in my opinion. Basically this is a fish that fights like a channel cat from a bad neighborhood and tastes like a lobster. What more could anyone want? The Ling king award goes to anyone who catches a burbot of over ten pounds. If you think you deserve this award, submit your giant burbot as a notable catch HERE.